Albert Baggetta is an English teacher and a professional guitarist. He resides in Agawam, Massachusetts, with his wife Beverly and their two children. He frequently can be found wandering the Atari SIGs on DELPHI. They say that an old song played with a new twist is like listening to a new song. A new person's ideas can make the old song sing anew. Well, I guess the same could be said for games, especially those designed for computers. Sounds-A-Like is just that: an old game with a new twist. You remember that old memory game (no pun intended) where you have in front of you a grid of cards facedown on the table. Each card has a mate, and all of the cards have been placed down randomly. Now you must pick up two cards at a time in hopes of matching them. Some versions of the game use pictures. Other games use letters, words, phrases or famous sayings. 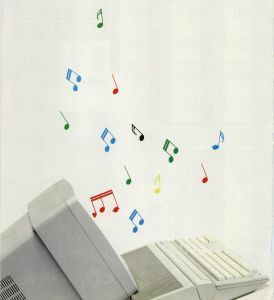 Lots of computer games have been created that use this similar theme, and Sounds-A-Like is now going to join them. The thing that makes this game a little bit different is that you will not be matching pictures or words. You will be matching sounds. The game is easy to play, and it is "mousified," which means that you can play the entire game with minimal use of the keyboard. When you boot up the main program, SOUNDS.PRG, the disk drive will begin to whirl, loading in the main screen. You will need a color monitor to run the game. (The screen, by the way, was done with Cyber Paint and saved as a DEGAS screen.) Be sure to turn up the sound on your monitor so that you can play the game What good is a sound game without volume? 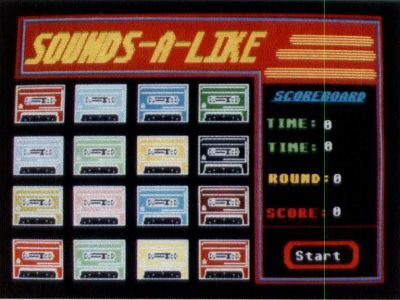 The game uses a cassette tape metaphor. To hear the sound recorded on a tape, you use the mouse to click on the little A on the left of each cassette tape (pretty good—tapes that play themselves). But first you must click on the start box in the lower right of the screen. You will be given the option of playing as a beginner or an expert. Beginner means that you will have 100 seconds to complete the matches. The expert will get only 50 seconds to do the same. Clicking on each tape now will bring forth the sound recorded on that tape. The sound will be identified in the Scoreboard box on the right of the screen. After you have tried two tapes, you will be notified of your success or your abysmal failure. Success will add ten points to your score. Failure will reduce your score by score minus time divided by 50 points. This is recorded in the Scoreboard box also. You will be working against time, so work briskly. The time allotted to you will be displayed in the top time register, and the time that is being used up will be updated periodically in the lower time register. Keeping your eyes here can be distracting; but then this is a game, and a little tension adds to the excitement. You will finish in one of two ways. Either you will run out of time, or you will match all of the recorded sounds. In any event you will be given a screen at the end that will announce to the world how well you did, not only in this game but also in the previous game you played. While this is basically a one-player game, it can be played alternately with an opponent. The previous score would then be that of the person who last played. The game is fun to play. In addition, it was easy to write, and it demonstrates some of the built-in power of MichTron's GFA BASIC. Have fun.